Western blot analysis of NFkB IP samples. IP was performed on Jurkat cell lysates using 10 µg (lanes 2 & 7), 5 µg (lanes 3 & 8), 1 µg (lanes 4 & 9) Sheep anti NFkB p65 antibody (AHP394), and 10 µg polyclonal IgG (lanes 5 & 10). Sheep anti Human NFkB p65 antibody recognizes human full length human p65 (NF-kB), also known as Transcription factor p65 or Nuclear factor of kappa light polypeptide gene enhancer in B-cells 3. Human NFkB p65 is a 551 amino acid pleiotropic transcription factor containing a single RHD domain. 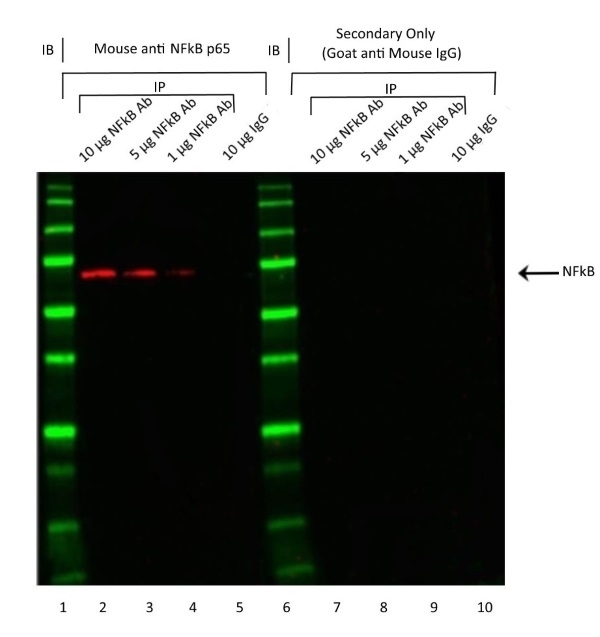 Sheep anti Human NFkB p65 antibody will also detect proteolytic fragments of NFkB p65 containing the DNA binding RHD domain located in the amino-terminal region. Multiple isoforms of NFkB p65 are generated by alternative splicing. Sheep anti Human NFkB p65 antibody binds to isoforms 1 and 2 containing the intact RHD domain, but it is unclear whether it will bind to isoforms 3 and 4 which have partial differing deletions within the RHD domain. Antisera to human NF-kB were raised by repeated immunisation of sheep with highly purified antigen. Purified IgG prepared by affinity chromatography. Lee, J.H. et al. (2007) Heparin inhibits NF-κB activationand increases cell death in cerebral endothelial cells after oxygen-glucose deprivation. J Mol Neurosci. 32: 145-54.